Let’s face it, we all secretly want to be seen as completely punk rock, even if we don’t have a musical or cool bone in our bodies. Some people might be more naturally inclined to reaching this level of coolness, while others might not be born with what it takes. 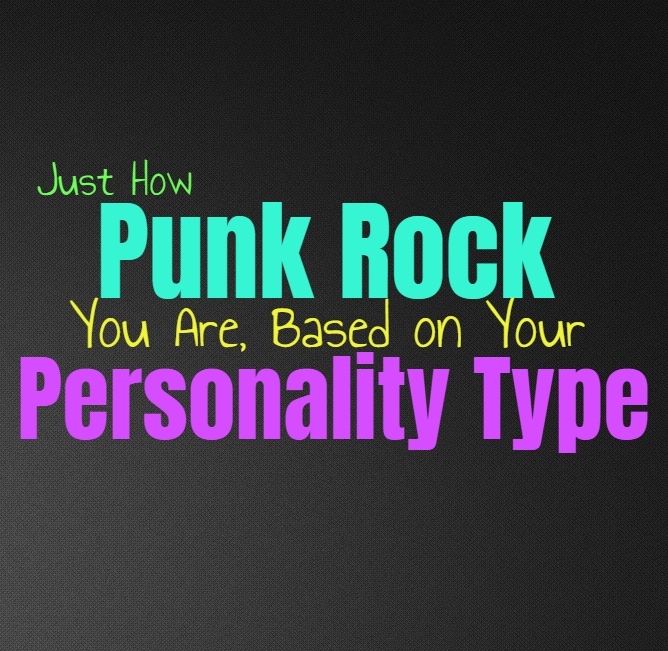 Here is how punk rock you are likely to be, based on your personality type. INFJs might appear straight lace and even nerdy on the outside, but they possess a truly punk rock soul. INFJs are not fans of authority or following rules which don’t make any sense to them. Feeling like they have to answer to someone who only seeks to control others, is likely the most unnerving and frustrating thing for the INFJ. They often go against what others expect, and rarely just believe something in a mindless way. They find themselves always challenging what they see and hear, and believe that people should be free to be themselves and make their own choices in life without being controlled. They also can be drawn to some more “conspiracy” sounding ideas, simply because they aren’t willing to blindly trust people. ENFJs are surprisingly capable of being punk rock, since they have strong personalities and believe in standing up for what they think and feel. ENFJs also don’t like being controlled and really dislike people who seek to control others. They enjoy being able to live their lives with a sense of free-will, instead of feeling smothered by “the man”. While ENFJs do have some very punk rock qualities, sometimes they can be more drawn to pleasing others and this prevents them from diving into this side of themselves. They might be more interested in living a sturdy lifestyle, so that they can take care of those closest to them, but that doesn’t mean they don’t have a punk rock heart inside of them. INFPs might be viewed as cuddly teddy bears, but that can actually be quite far from the truth. While they have caring hearts filled with emotions, they can also be strong-willed and rather anti-authority. INFPs can actually be some of the most punk rock people out there, especially if they dive deeper into this side of their personality. The INFP who is tired of being pushed around and just wants to live their own lives, will certainly be showcasing their more punk rock qualities. They are not fans of being controlled, and believe in standing up for their beliefs no matter what. ENFPs are often seen as more peppy and positive people, but they possess a heart which is deeply complex. While some ENFPs might go towards a more preppy or lighthearted path, others can certainly tap into the punk rocker inside of them. Some ENFPs are complex anarchists, focused on going against and challenging authority at all costs. It is often their desire for freedom and exploration which makes the ENFP much more punk rock than people could possibly imagine. And to be honest, some of the most punk rock artists out there are actually ENFPs. INTJs are often seen as straight laced people, and this can certainly be the truth. They do believe that rules are meant to be followed, but only the ones they personally have faith in. INTJs are not afraid of standing up for their beliefs even if it offends someone else, and this is the most punk rock quality about them. INTJs might not believe in taking unnecessary risks for the sake of their free-will, but they do believe in following the path they desire regardless of others trying to tell them they can’t. INTJs have fiery spirits, ready and willing to challenge anyone who they believe is in the wrong. While many of them might not walk the punk rock path, that doesn’t mean there isn’t a punk rocker inside of them. ENTJs are very headstrong and focused people, but they are rarely seen as punk rock. To be honest they might fit the metal description a bit more than the punk rock one. They don’t like being controlled, but at the same time ENTJs do seek their own sense of control in life. They believe in going after their goals and can be rather fierce in this effort. For ENTJs rules are valuable and being efficient in everything they do is truly important. Because of this they might not be the most punk rock people, but they certainly have a fire inside of them. INTPs can sometimes be viewed as nerdy and reclusive people, but that doesn’t mean there aren’t punk rock elements to their personalities. They can often be focused on conspiracy theories, and have a hard time trusting everything they hear. INTPs don’t rely on authority to instruct them, instead they often believe in breaking the rules. This desire to go against the grain is definitely a punk rock quality, and is something the INTP possesses immensely. They might not always follow the more aggressive and feisty side of the punk rocker, but if someone brings this out in them it is certainly in there. ENTPs are rebellious by nature, which is something that makes them much more inclined to the punk rock scene. They go against what is expected of them, sometimes just fo the sake of being defiant. They believe in challenging authority and don’t feel like they should be forced to follow the rules just because someone else places them. ENTPs are fiery people who want to experience life on their own terms, without having to answer to anyone else. This ability to stand up for their beliefs and be unafraid of an argument, makes them rather punk rock. While ISTJs are strong-willed and driven people, they don’t often possess the qualities which would be considered punk rock. They are often very sturdy people, who believe in following rules and want to do what is right for their loved ones. While they might be deeply passionate people, they simply aren’t focused on breaking rules or going against the grain. For them stability and structure is far more important than constantly seeking to challenge authority. ESTJs are strong people who are willing to take on challenges in life, but they aren’t really the most punk rock people. They are drawn to being efficient and believe in working hard to get things done. ESTJs are more interested in stability and structure, rather than going against the grain just for the sake of being defiant. They enjoy rules, especially ones which help them become more efficient and valued members of their community. ISFJs aren’t often seen as the most punk rock people, simply because they value harmony and structure. ISFJs are more drawn to practical things, and believe in doing their best to care for their loved ones. For the ISFJ it can seem reckless and foolish to challenge authority and go against the rules simply for the sake of being defiant. While there might be some punk rock aspects to their spirit, ISFJs don’t really follow this path most of the time. They prefer to follow what they know, and seek out structure and stability in their lives. While many ESFJs might actually possess a rather punk rock heart, this isn’t something you will see expressed. They often forgo their own desires and feelings, in order to provide for the people they love. They want to be able to take care of others and can be more focused on structure and harmony. While they might feel an inner desire to go against the grain and experience things this way, ESFJs are more inclined to follow the rules in order to provide for the ones they love most. ISTPs can certainly be punk rock, especially since they are such mysterious and spontaneous people. They don’t believe in following the rules and really enjoy being able to go against what others expect from them. They aren’t afraid of taking risks and often seek ways to defy what authority wants them to be. Since they are such thrill-seeking and independent people, ISTPs most certainly fit into the punk rock category. ESTPs can often go both ways when it comes to how punk rock they might be. The young ESTPs is often very defiant and enjoys challenging authority whenever they can. They find themselves wanting to break the rules and get a thrill out of not doing what they are told. As they get older they might grow out of this and prefer to seek out accomplishments and comfort in their loved ones. Because of this the young ESTP is often very punk rock, while the older ESTP might become a bit straight laced. ISFPs can often go either way when it comes to just how punk rock they might become. Some ISFPs seek their free-spirited side in a more spiritual way, seeking out nature and warming experiences. On the other hand ISFPs follow their hearts wherever this might lead, and sometimes this draws them towards becoming anti-authority and just a bit punk rock. ESFPs are adventurous and independent people who enjoy seeking out new thrills. They don’t enjoy following the rules and truly despise when someone seeks to control them in any way. ESFPs are definitely punk rock people, with fiery and enthusiastic spirits. Some of them might lean more towards the attention seeking side, and so this version of the ESFP might not be quite as punk rock. While others find themselves wanting to follow their more anti-authority traits, seeking out the punk rocker inside of them.